The quality of luxury products comes from the details: excellent materials, skilled crafting, and thoughtful design. It takes a good understanding of these elements to buy the kind of luxury product that lasts a lifetime and becomes your companion, not just a thing that you own. Frustratingly, for many people, understanding the details of high-end leather goods can be intimidating, with an overabundance of terminology and mixed advice. Michael pulls out a full-sized hide from the back that’s been specially made to show the different steps in leather processing. 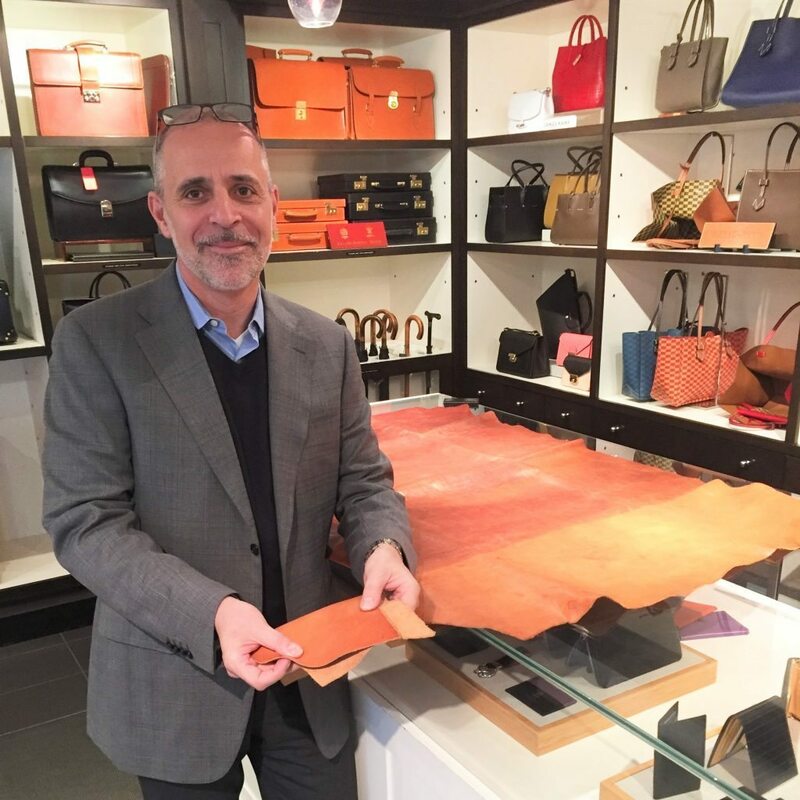 He shows me what to look for: it’s important to find full-grain leather—so-called because it has a natural pattern or “grain” from the animal’s skin. Real leather should never look picture-perfect. “Genuine Leather” is a processed product, made up of leather fragments, and should be avoided. Betty Hemmings sources leather from Europe, where it’s easier to find cattle that are grown without hide-stretching steroids and where there are fewer biting insects that will create blemishes. In addition to using your eyes to suss out the grain, you can often use your sense of smell to pick out higher-quality leather. Processed leather products or leather that has been put through cheap and fast tanning will smell like chemicals. However, real leather that’s been tanned over a longer period of time, such as seven days, using olive oil and extracts from chestnut and oak trees should smell almost edible. Michael lets me get a good sniff of his demonstration hide. My best description is that it smells like smoked rare mushrooms in olive oil, almost edible. Leather tanned properly, using natural extracts, is longer-lasting and more environmentally friendly, since the processing doesn’t leach off synthetic chemicals. 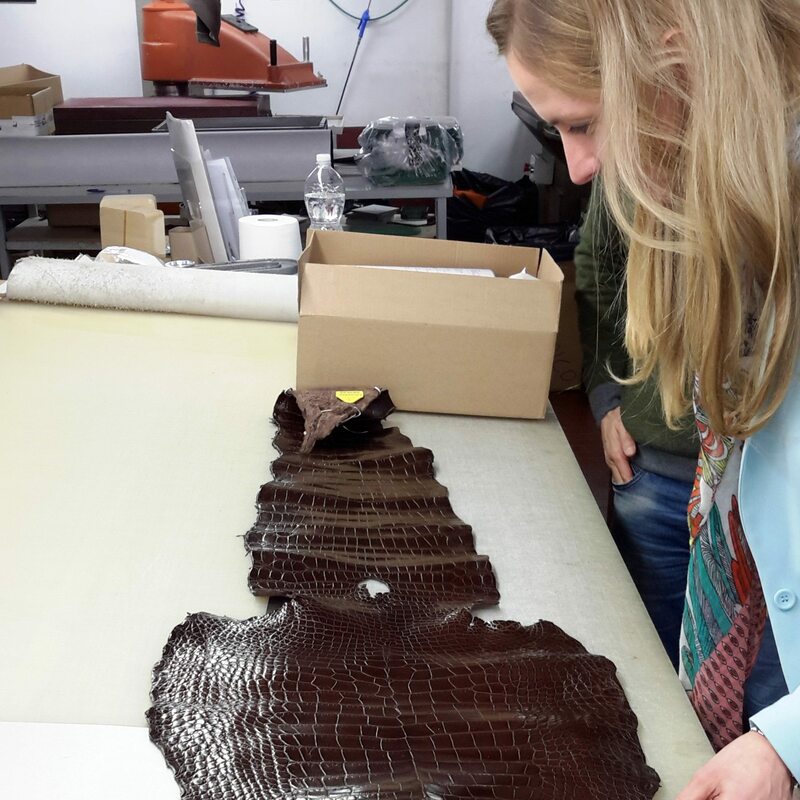 Alexandra Warwick inspecting an alligator skin to be used to make wallets. Photo courtesy of Betty Hemmings. Photo courtesy of Betty Hemmings. Edited by Ben Coleman. The parts of a bag or case that take the most stress over their lifetime are the fixtures: zippers, locks, chains, and clasps. Michael tells me that Betty Hemmings only carries products that use fixtures made of pure, hard metals, such as brass, nickel, and palladium. He shows me a bag that a customer purchased from the store in 1980, 37 years ago (above). The lock mechanism has finally worn out, so he’s replacing the clasp. He points to a slight greening around the brass handle loops—a telltale sign that the metal is pure. I’ve seen the coloration before on the handmade raw brass instruments used by orchestral musicians. Getting the details and high-quality stitching right often requires that the work be done by hand, or with specialized equipment. Michael shows me a photo of a massive heirloom sewing machine used by Swaine Adeney Brigg to punch holes in the thickest leather. He also explains how some of their products use hand stitching with two needles, which you can see in action in the video below. Swaine Adeney Brigg creates attachés and briefcases, but they are also known for their umbrellas, which are used by the royal family and are practically indestructible. According to Michael, it’s one of his most popular products. There is even a “Prince of Wales” model with a signature silver cap on the end of the crook. The advantage that puts Betty Hemmings ahead of other luxury retailers is that they don’t just sell leather products as part of larger fashion collections—leather is their core competency. 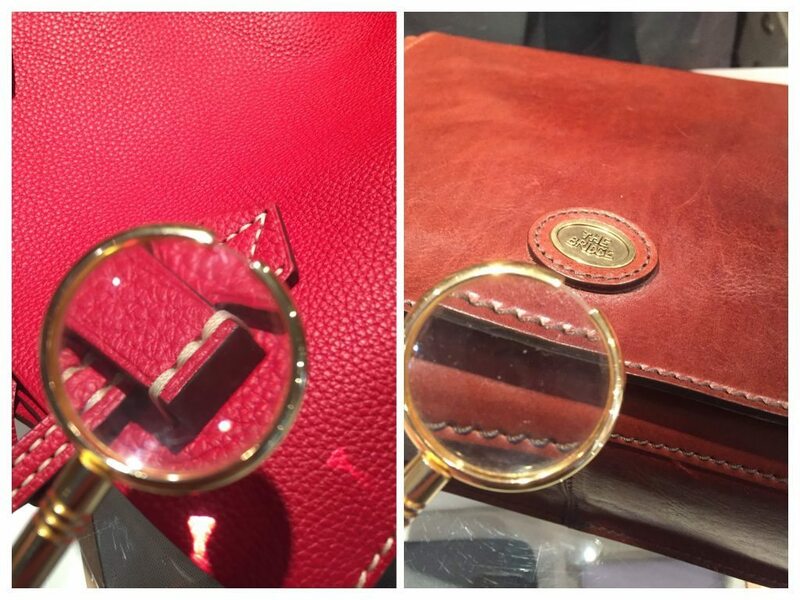 Michael pulls a handbag and a briefcase off the shelf, rummages out a small magnifying glass, and shows me the kinds of details that he looks for to make sure a product is long-lasting. The bag made by The Bridge (right) is double-stitched in thick nylon thread. The double-stitching means that even if a stitch is cut on one side, it won’t unravel like a seam on a shirt would, keeping the structural integrity intact. The Moreau Paris purse (right) is hand-sown with silk and has triple-stitching at stress points, such as where the handle attaches to the bag. Image courtesy of Betty Hemmings. 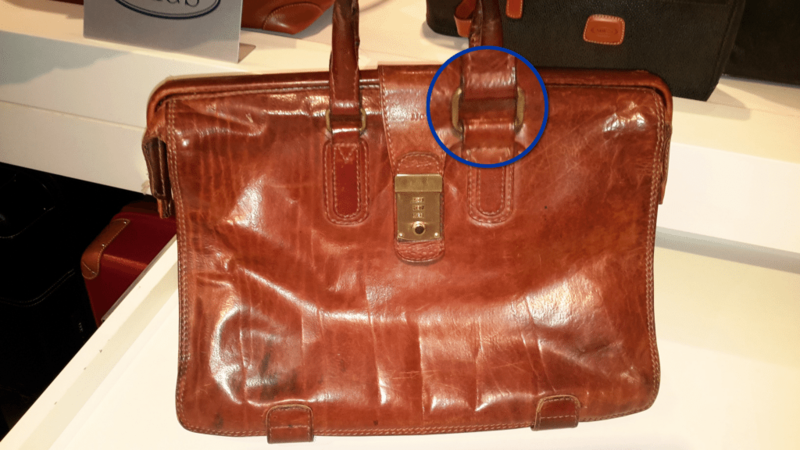 Part of what makes Betty Hemmings so successful is that Michael is an expert leather brands curator. Many of the brands that have excellent craftspeople and use the highest-quality materials don’t have the large marketing budgets of the leading luxury brands. 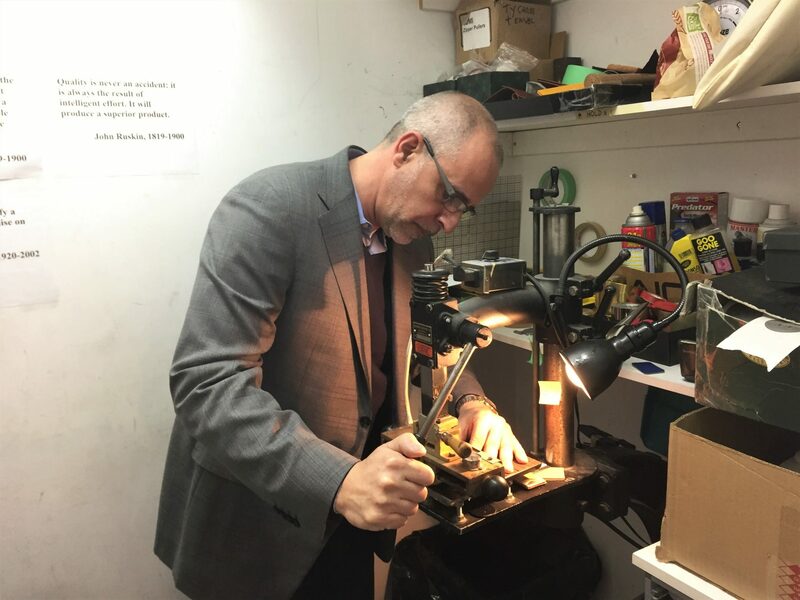 A key part of Michael’s expertise is finding the lesser-known brands with the proper quality and heritage and making their luxury products easy to find in Canada at the Betty Hemmings store. Another benefit to Michael’s expertise is best explained with a story: in 2014, NPR’s Planet Money reported on a company called Monoprice, who are primarily known for selling cheap, well-made electronics accessories such as cables and home theater accessories. One part of the story talks about the time the company was able to make a deal with the same factory that made the screens for the ground-breaking $999 Apple Cinema Display. Monoprice was able to offer the same stunning high-resolution display with their own case and branding for less than half of Apple’s price—a well-known secret in tech circles. Like Monoprice, Michael knows a lot about suppliers. 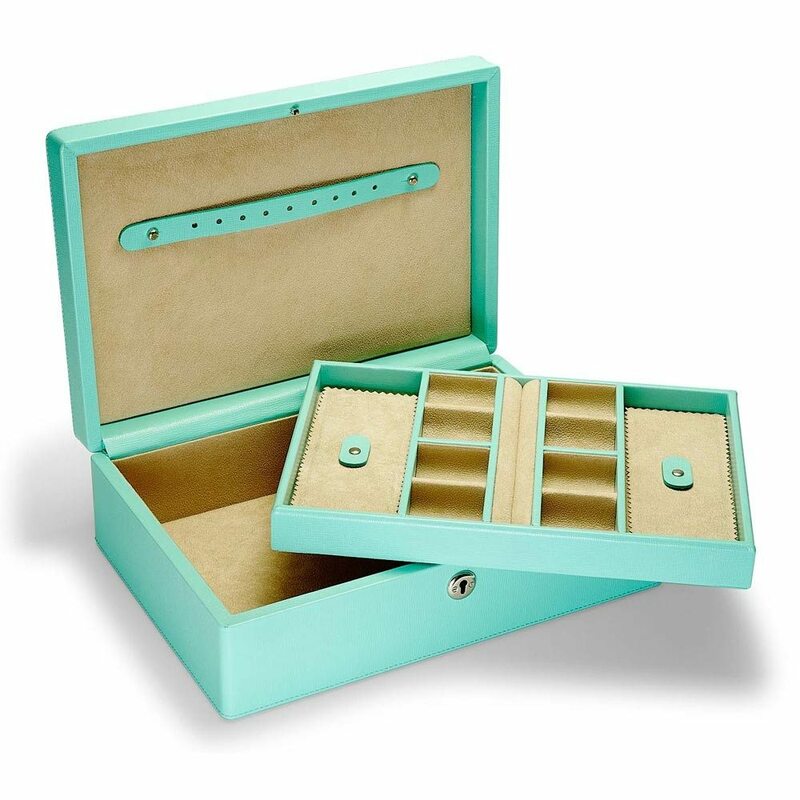 He shows me a stunning blue jewellery box handmade in Italy with stunning turquoise calfskin leather. In another store, it might have a designer brand name attached on the inside. The Kazmok Director briefcase. Photo courtesy of Betty Hemmings. 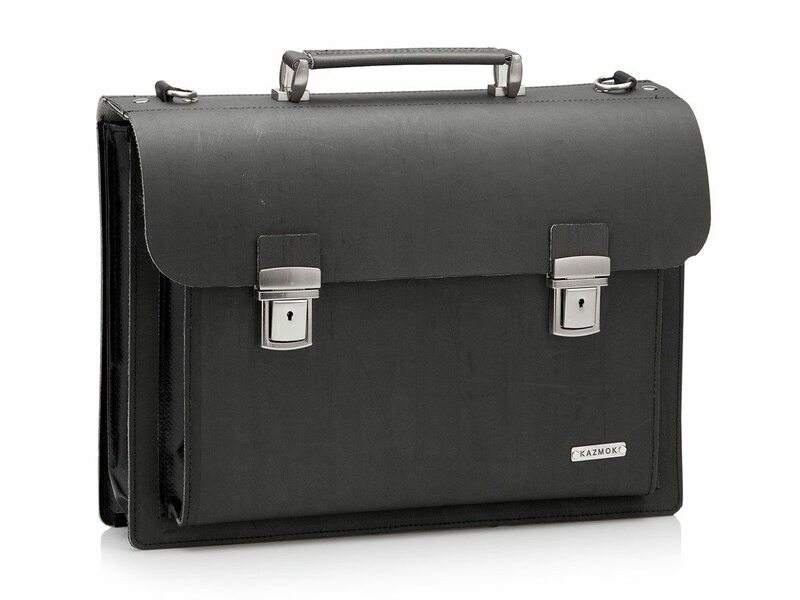 One of the newest brands that Betty Hemmings carries is Kazmok, a briefcase company from the Netherlands. Instead of leather, they use a unique and hard-wearing material: recycled industrial conveyer belts. With solid nickel fixtures and a material that spent its past life moving tons of cargo, Kazmok briefcases are among the most rugged products that Betty Hemmings carries. Michael tells me he often suggests Kazmok to high-level executives working in gritty industries, such as construction or mining, where the customer may be on site one day and in a boardroom the next. Even though the briefcase material had an unglamorous previous life, their exceptional award-winning design makes them right at home among the luxury leather briefcases on Betty Hemming’s shelves. Michael Warwick stamping a monogram onto a wallet. Near the end of my visit, Michael is eager to show me how he hot-stamps customer initials onto a product. Monogramming is a common addition that many Betty Hemmings customers request to make their purchase truly personal and unique. He takes a wallet from behind the counter and shows me to a small back room with a large hot press inside. As he works the hot press, Michael also talks about the other services he does for Betty Hemmings customers. All of the products come with long warranties, ranging from 2-10 years, depending on the brand. Customers often come back to Betty Hemmings as a trusted place for repairs, even decades after their original purchase. In addition to the 37 year-old bag, he shows me a Tumi suitcase he’s touching up in the back that was bought by a customer 19 years ago. Because he sees products coming back to the store for minor repairs, he has confidence that they will last for a long time. Luggage is put through some grueling wear and tear over its lifetime. It has to withstand being dropped and shoved during loading, and it has to endure extreme temperature changes that can range from ‑40°c to +30°c in the uninsulated hull of an aircraft. For travellers that are on the move at least a couple times month, all of this can wear out a suitcase quickly. However, high-quality luggage can stand up to the test. Michael tells me that one of his customers had been the most frequent flyer with Air Canada one year, with 217 flights in total. One brand of luggage that has luxury pedigree combined with rugged endurability is Globetrotter, which has been established for over 100 years and has an impressive list of former clients: Sir Winston Churchill, Sir Edmund Hilary, and like Swaine Adeney Brigg, the Royal Family. Similar to the briefcases made by The Bridge that Michael showed me earlier, the formula that keeps them long-lasting is simple: strong construction and fixtures, good design, and high quality leather. As a final demonstration, Michael grabs a Hartmann suitcase which is made of a fiber-reinforced thermoplastic. It’s strong and flexible and—he claims—resilient enough to be stepped on. Not one to make a statement without backing it up, he lets me take a video of him stepping on it: it pops back into shape without a scratch or dent in sight. The dramatic demonstration is fitting for my visit: Michael Warwick is a man with complete confidence in the products he puts on display at Betty Hemmings, and a willingness to really show his customers what makes those products great. Story by Ben Coleman. Cover photo and article photos taken by Ben Coleman unless indicated otherwise.